Getting your bike (in or out of box) to Whistler is hassle free! 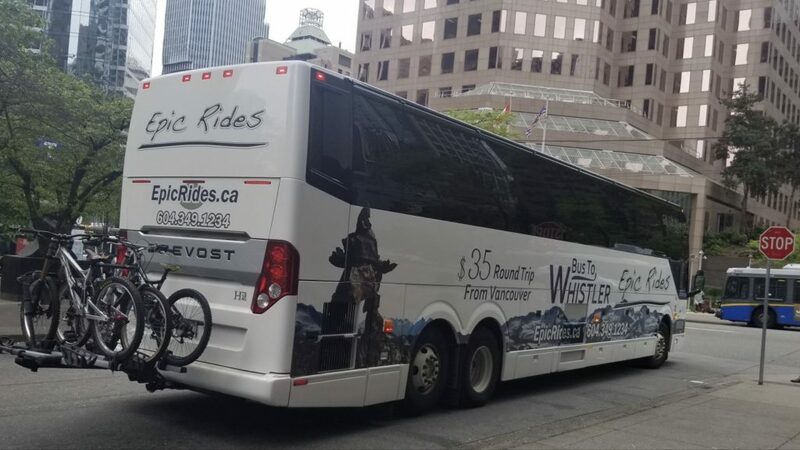 Taking your bike to Whistler with our custom-designed bike trailers is fast and affordable, we can load and unload your bikes in a snap and we don’t charge anything extra for bringing bikes from Vancouver to Whistler. We also have custom designed storage to ensure you can bring as much luggage, equipment or extras as you need without having to worry about enough room. We reserve room on each bus for a limited number of bikes in boxes. Please note: we do not Carry bikes between November and April. If you are biking in Whistler frequently, check out our season pass and save money! Please note the only way to guarantee no chips or scratches is by putting your bike in a box. Our trailers are exposed to the elements and may be hit by stones from oncoming traiffic. We could also hit pot holes or other debris on the road. Small scratches, rubbing and / or chips may happen. Epic Rides takes no responsibility for any bike damage.